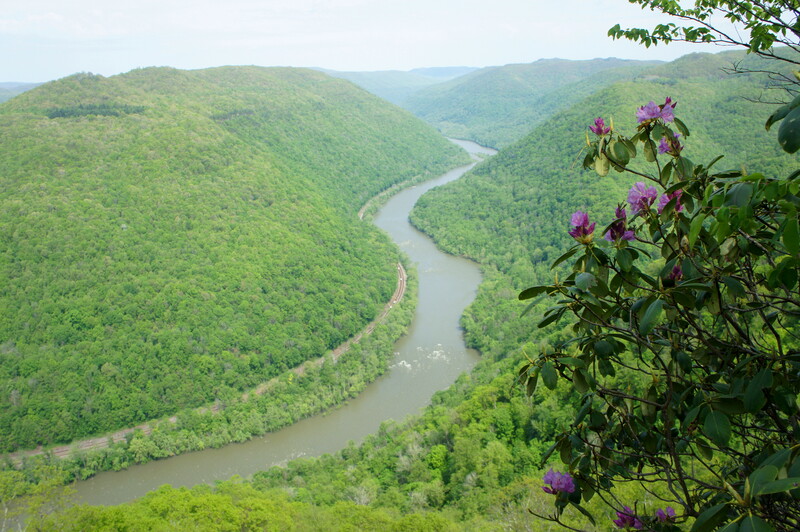 Lacking the most creative nomenclature, the Grandview area at West Virginia’s New River Gorge National River nonetheless lives up to its name, boasting spectacular vistas and craggy cliffs. With New River some 1,400 feet below, the Castle Rock/Grandview Rim Trail loop leads hikers to some of the best viewpoints in the park. At least the Castle Rock Trail, however, requires some work: the rock-adorned path dips and dives through stony ravines and climbs steep fingers for 6/10 mile before merging again into the much smoother Grandview Rim Trail. Hiking boots are a must, but the circuit is short and sweet, probably taking no more than 1 ½ hours for most hikers. 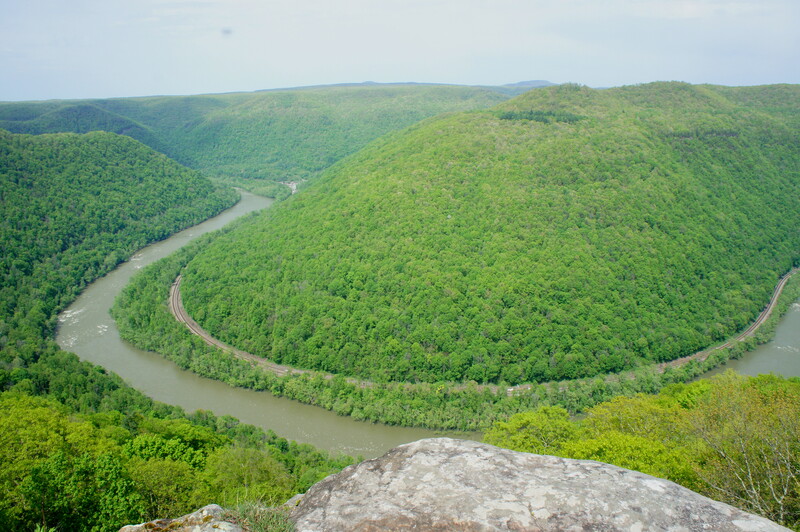 The Grandview area is one of the park’s closest sections to Beckley, a surprisingly crowded former mining town in south-central West Virginia. 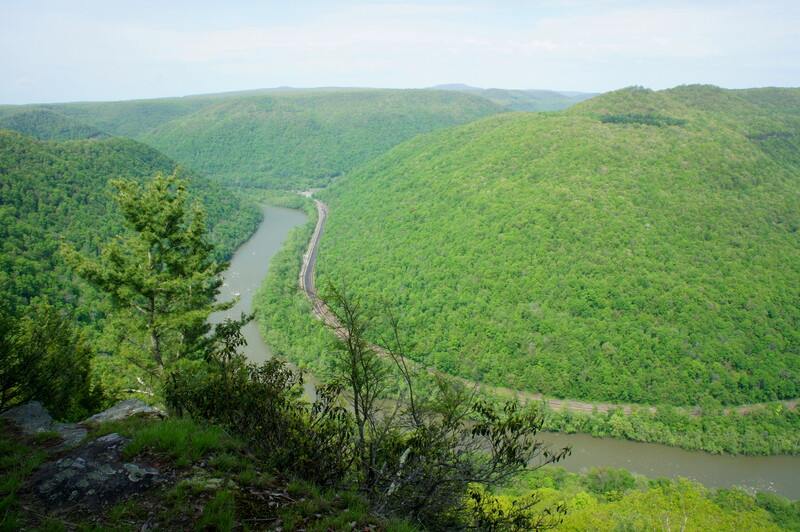 Only 13 miles from the heart of town, Grandview is a popular spot for picnicking, climbing, and, of course, hiking. 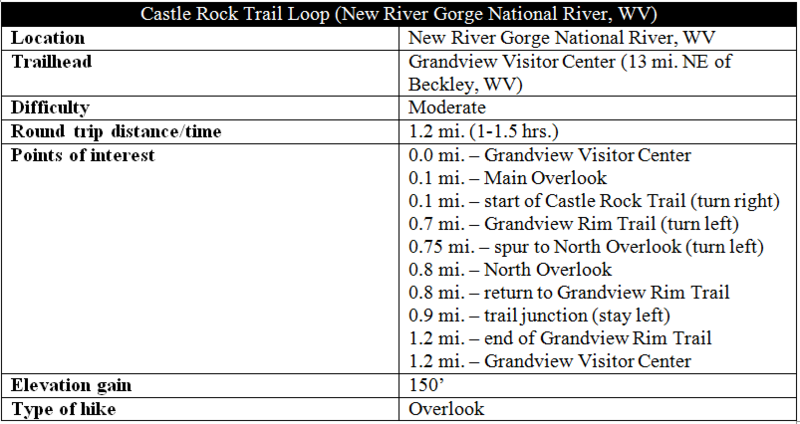 The Castle Rock/Grandview Rim combination loop covers 1.2 of the area’s 8+ miles of trails and includes some of the best views of New River Gorge. 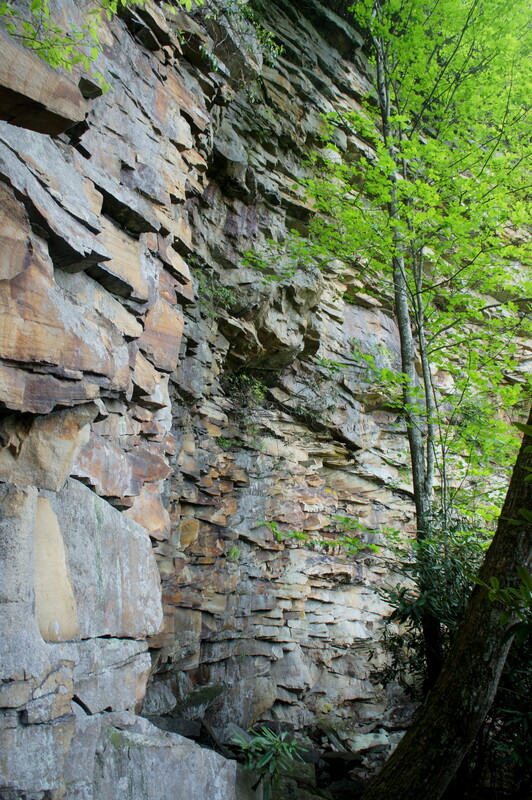 To reach the trailhead, drive east on I-64 from Beckley, leaving the highway at Exit 129B. Head north on Grandview Road for five miles to the park entrance, then follow the signs to the Grandview Visitor Center. Park on either side of the Visitor Center, a modest, sun-soaked building situated at the grassy center of the circuitous parking area. The well-marked trailhead is located across the street to the east. 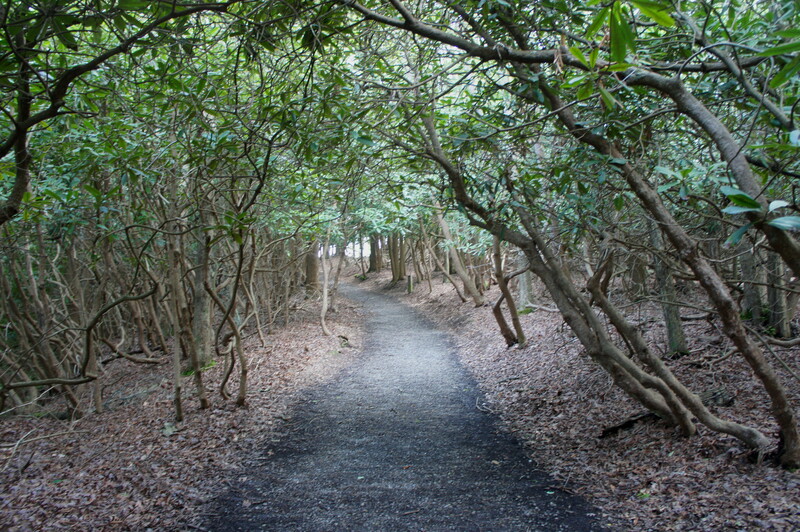 Neatly tiled and wheelchair-accessible, the checkered rock path takes off across a grassy pitch, with other trails almost immediately bearing off to the left and right. Stay straight for about 1/10 mile to the Main Overlook, the most popular viewpoint in the area. Here the wooded plateau suddenly gives way to a precipitous cliffside, and a break in the trees offers a stunning view of a hairpin bend in New River Gorge. Rapids dot the winding river—thought to be one of America’s oldest waterways—located 1,400 feet below, paralleled by an active railroad. 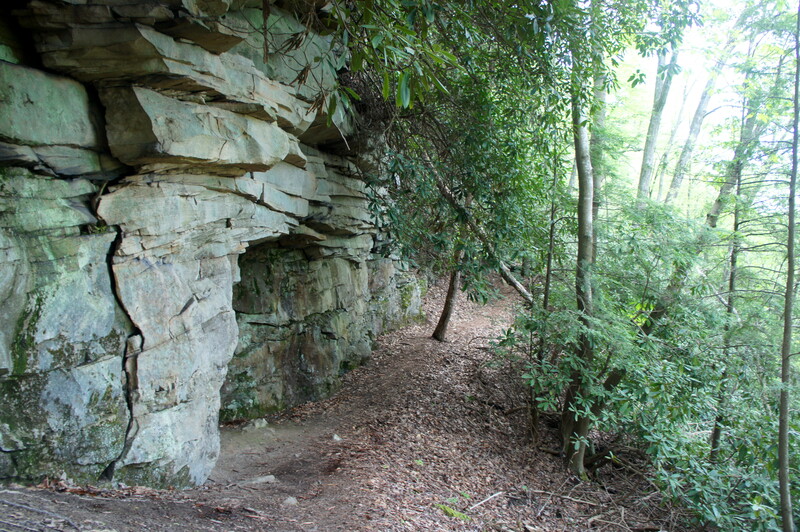 To reach the Castle Rock Trail, backtrack around 50 yards from the overlook and turn left on the signed route, which immediately heads into the woods. 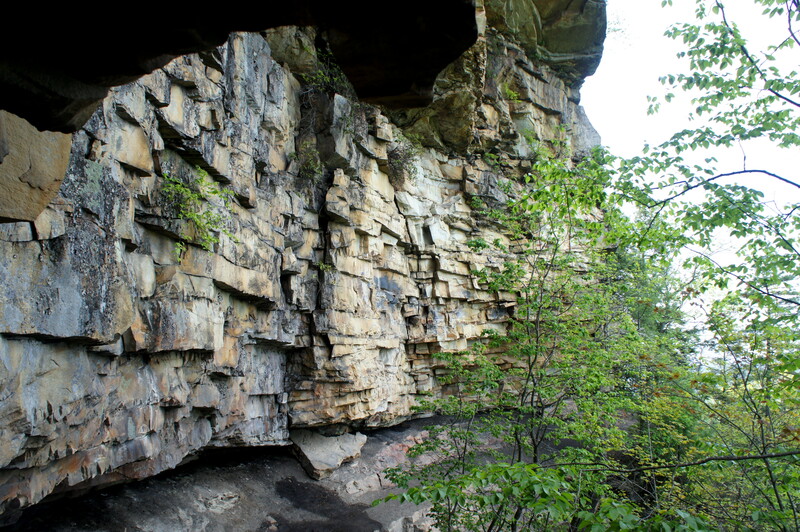 Dusty and narrow, the Castle Rock Trail quickly descends to a point situated at the foot of a blocky wall of sandstone. Rhododendrons abound as the trail bobs and weaves amid rocks and tree roots, obstacles that require sure footing to maneuver. From the second wall, the Castle Rock Trail rounds another bend and enters denser brush, which clogs the steep gully leading up to the third overhang amphitheater. After clearing this ravine, the trail cuts west and begins to climb in earnest: the final push back to the canyon rim. 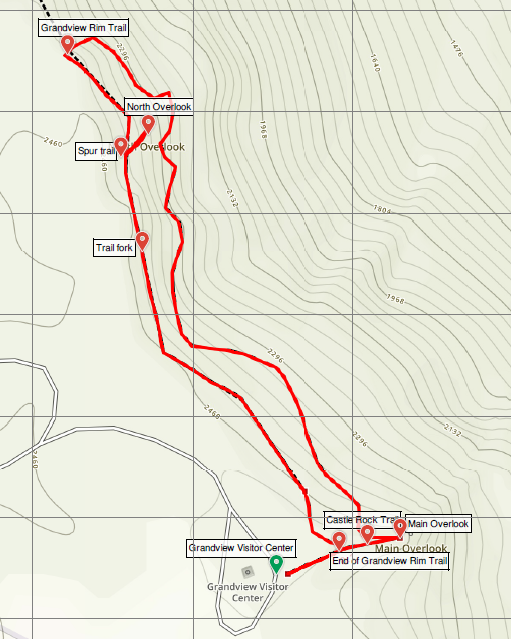 After gaining around 130 feet, the trail ends at a junction with the Grandview Rim Trail, about 7/10 mile from the start. Bear left on the Grandview Rim Trail, which travels across mostly level ground as it makes its way south back to the Visitor Center. After a couple minutes, look for a spur trail to the left. This path, a worthy detour, treads downhill to three established viewpoints, together forming the North Overlook. The view here is very similar to that of Main Overlook…but has far fewer visitors. Working your way back to the Grandview Rim Trail, take a left and continue southward through dense greenery. At 9/10 mile, stay straight at the trail junction. (Note: There is also a water fountain here.) Then continue along the occasionally-graveled path as it bears southeast, skirting the edge of the gorge—100-150 feet above the Castle Rock Trail below. At 1.2 miles, the trail reemerges from the thick woods, returning to the initial grassy patch adjacent to the parking area. Bear right, following the short path back to the road and Visitor Center. Allot around an hour to 1 ½ hours for this moderately strenuous hike. Use caution on the Castle Rock Trail—it’s literally more than a 1,000-foot tumble off to the right! 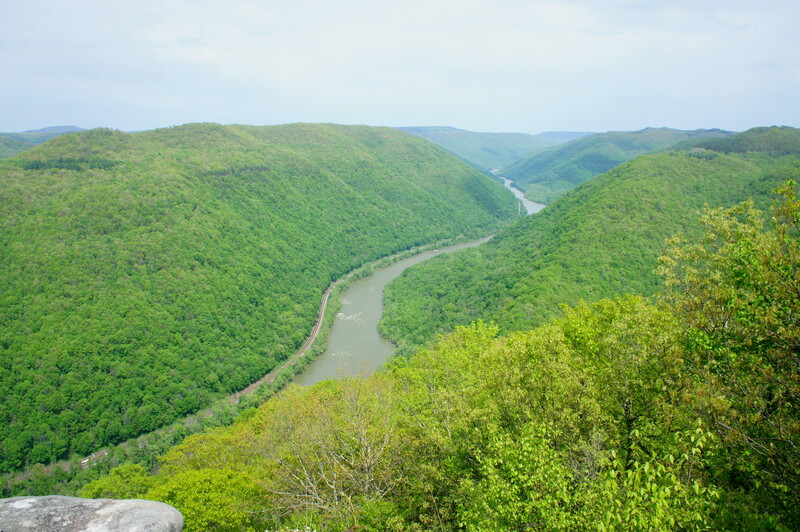 This entry was posted in Moderate Hikes, New River Gorge National River, West Virginia and tagged canyon, Castle Rock Trail, Grandview, Grandview Rim Trail, loop hike, Main Overlook, New River, New River Gorge, North Overlook, Nuttall sandstone, West Virginia. Bookmark the permalink.